A brief history of Easdale …. according to an enthusiastic newcomer ! Me, on a normal day ! Hello, my name is Nick and I am one of the new crew here at Seafari Adventures. I love my job, the nature and environment that we work in. But what many people often overlook is the sheer amount of history that exists here. 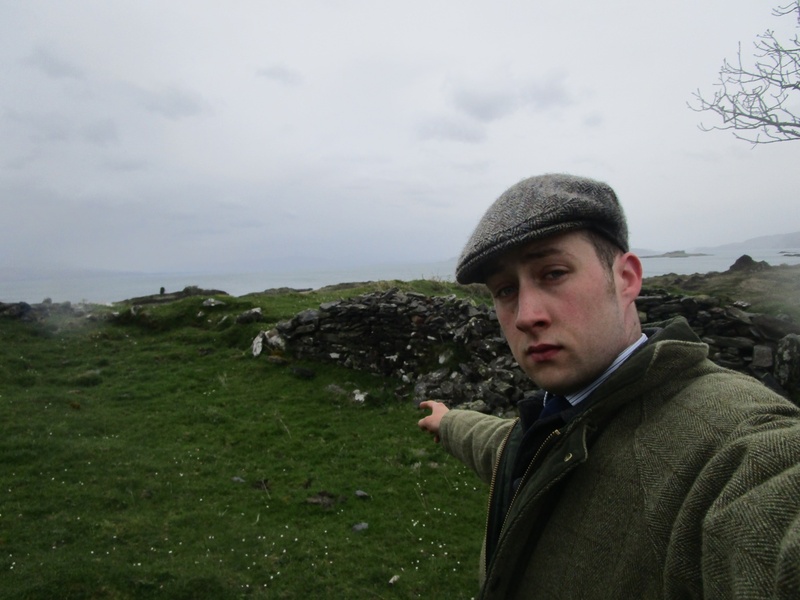 I should point out at this point that I am really enthusiastic about history so working in Easdale is a really interesting experience for me. 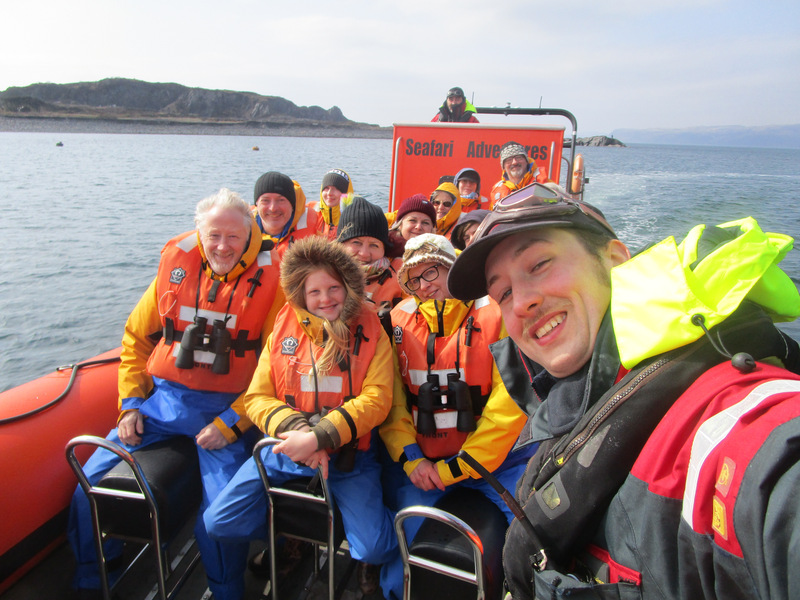 I hope to, in this brief blog, give you an idea or taste of the history of Easdale and the surrounding area as I have experienced it. The story of Easdale starts with the arrival of the first people as the ice age starts to end, somewhere around 10,000 years ago this is an era known as the Mesolithic or middle Stone Age. As the ice melted the coast of Scotland became accessible unlike the frozen inter-area of the highlands, so there may have been people on/around Easdale 10,000 years ago. 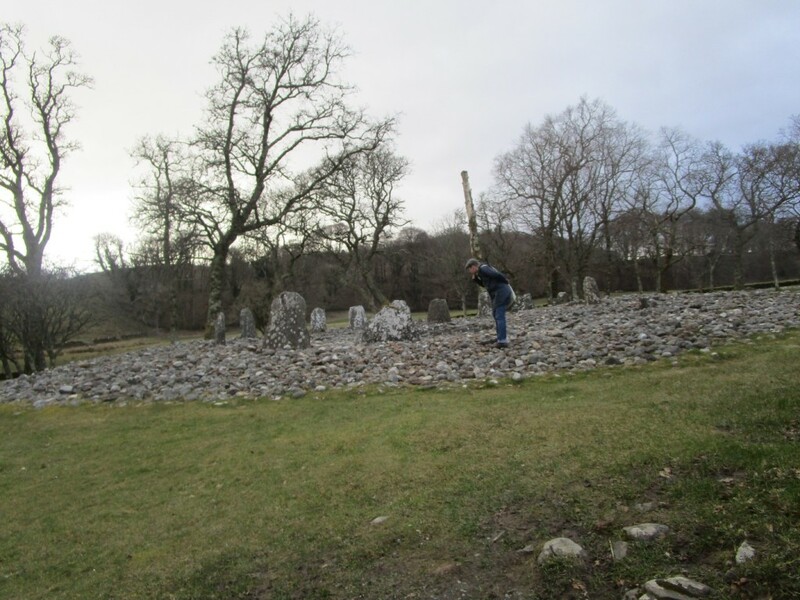 Fast forward to 5000YA (years ago) or 3000BC and we come across one of Argyll's first historic sites, the standing stones in the Kilmartin Glen just south on the mainland. These standing stones were mostly likely for burial and ceremonial uses; these are among some of the oldest standing stones in the British Isles, older than Stonehenge. 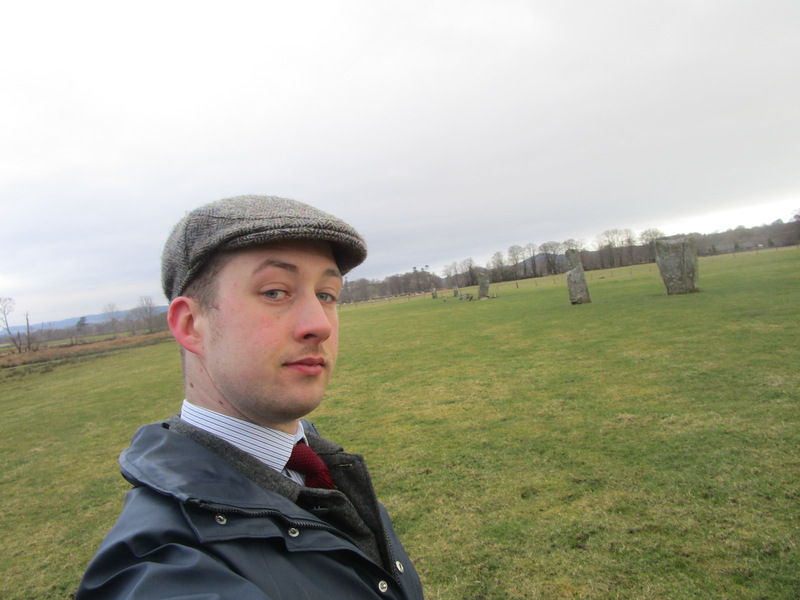 Me at the Kilmartin Standing Stones. Now you may wonder why I not talking about any prehistoric sites on Easdale, well there are a few reasons for this. 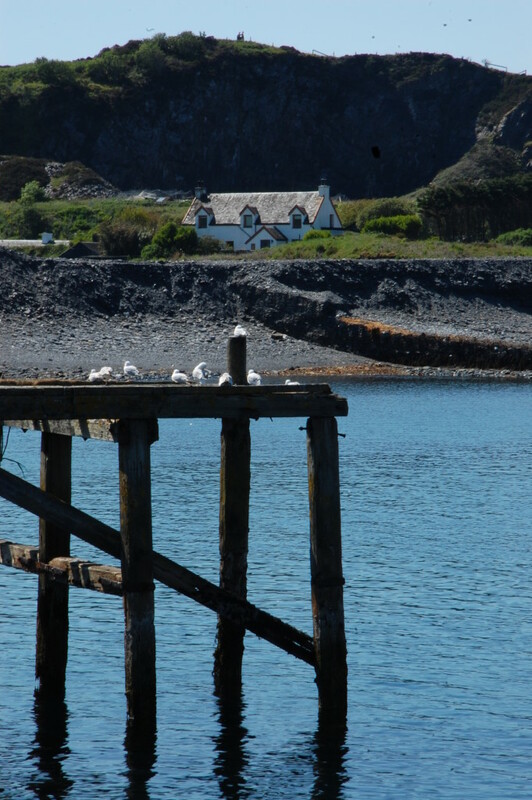 For a start Easdale, for most of its modern history, has been a quarrying and industrial site and in more modern terms it is now an area of historic conservation. So in layman's terms the area has been scoured and then legally protected so there have been few archaeological digs. 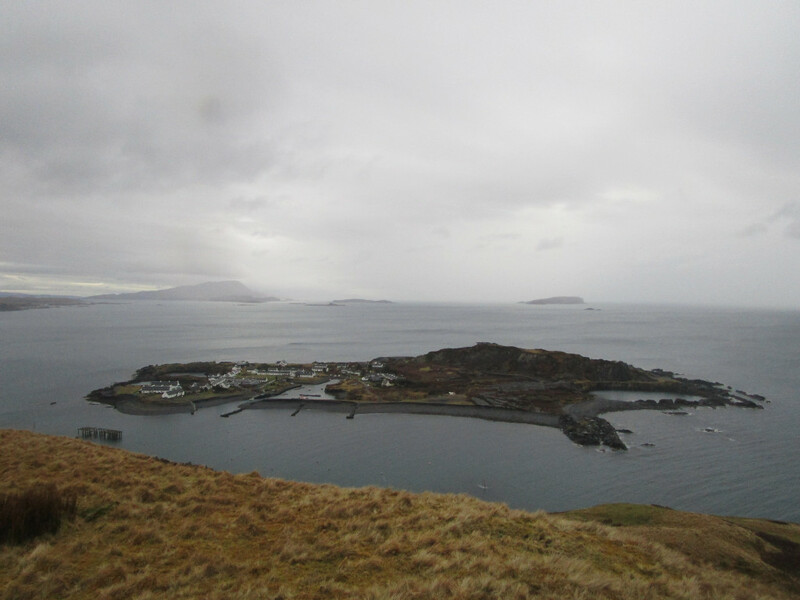 Easdale Island - view from Seil. As we speed through history however, we get ever closer to Easdale as we arrive on the neighbouring island of Seil where you can find several old mounts - most likely old forts. However, there has been very little archaeological surveying on these sites which is rather frustrating. At a guess they are likely to be somewhere between Iron and medieval. I appreciate that is far from accurate, a gap of roughly 1700 years. Having said that, the dinosaurs died out 65 million years 50 years ago and the years have not been changed to 65,000,050! A quick note to those who are enthusiastic about medieval history, there are several ruined chapels and an old ruined castle to be found on Seil. The remains of Ardfad castle on Seil. Finally we arrive on Easdale, an island which is about half a mile long with one craggy hill, deep gouges of quarries and small lime washed worker cottages. Easdale, looking at it from a defensive point of view, looks perfect for a small rural settlement as it has great access to the sea; it has a freshwater supply, some fertile land and a great vantage/defensive hill. A hill which was actually used by the local militia volunteers during the nineteenth century as a mounting point for cannon as part of a nationwide volunteer force as a local defence against the threat from France. There are accounts of Easdale being quarried going back to the 12/13th centuries for local buildings of stature. Easdale used to be part of the Ardmaddy Estate and at certain times the Earl would gather the farm labours, who would be supervised by an engineer, and cut slate for a contract/project. The two main catalysts of the quarry industry on Easdale were the Jacobite rebellion and the industrial revolution. In response to the first Jacobite rebellion the Earl invested in infrastructure in order to help exploit the local natural resources of the area to improve the local people’s lives. Also during the Jacobite rebellion local men left the quarries to fight for the British army as part of the Argyll militia and, being on the winning side, meant the quarries/locals were left unharmed, unlike the clans which aided Bonnie Prince Charlie. In 1745 Easdale came under new ownership, and with this came a permanent mining workforce and other innovations such as improved pumping engines. During the nineteenth century technology improved, such as the introduction of narrow gauge railways as well as improved opportunities to export to the British Empire. A proportion of the profits were now also invested into the workforce to improve their lives. The workers now had access to health insurance and improved education and a doctor who helped improve the sanctuary conditions of the housing. In the winter of 1881 there was a severe storm and a tidal wave flooded the major quarries of Ellenabeich and Easdale. This was the beginning of the end for the local mining industry because, although attempts were made to restart the industry, there was the allure of gold in the colonies and South America and with their mining skills and local industry failing many left to seek their fortune abroad. One of the finial blows was the loss of the number of young men in the Boer War because Easdale maintained its local defence force and when war came they were called up and were sent to South Africa, many of which did not return. The other issue was the competition from other local and Welsh slate quarries. The last ship to steam out of the Easdale sound with slate was in 1911. The low point came during the 1960s when the population of Easdale dropped to 4 people. However, in the last few decades a combination of tourism, people retiring to rural areas and commuters to Oban, the local population has seen the community regenerated to a more permanent population of around 60. So, in conclusion, Easdale has a fascinating history and I personally believe there is a lot more to the island that has been lost or is still to be discovered. Just as an example, while digging a ditch last month I found a nineteenth century pocket watch which is now in the local heritage centre, so it goes to show that you never know what you might find. 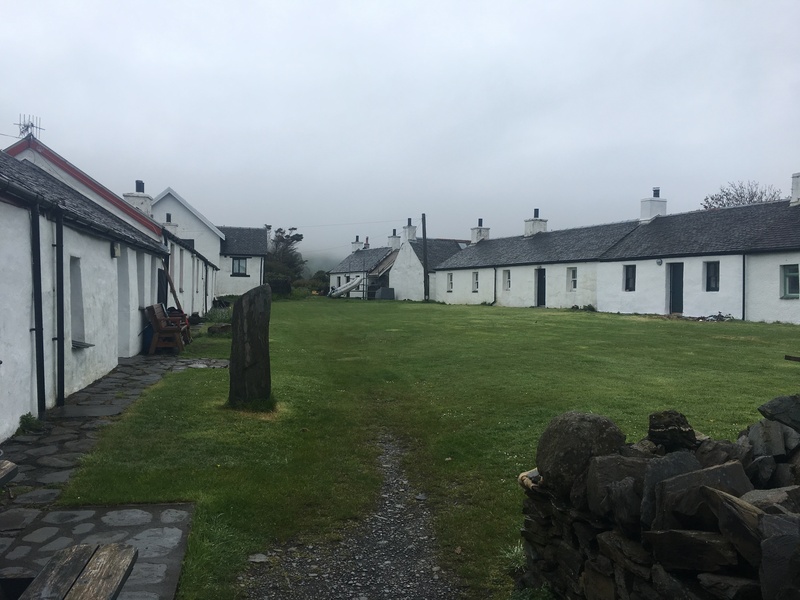 If you would like to find out a little bit more about Easdale then I would highly recommend a visit to the Heritage Centre and Museum in Ellenabeich (click here for more information) and the Easdale Island museum (click here for more information). I would also like to thank the staff at the Heritage Centre for answering my many questions and the many fantastic books on the area which helped me greatly. Posted in Blog on May 15, 2018 by carolyn.